This slow-growing Australian tree has a spreading crown and large glossy leaves, each with 11-15 leaflets. 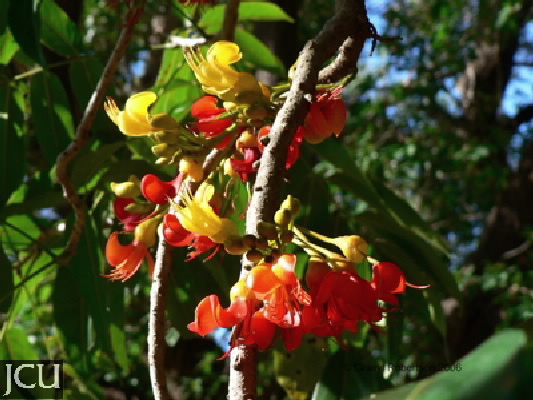 The orange or yellowish pea-shaped flowers are borne in clusters on the branches so that they are partially hidden by the leaves. 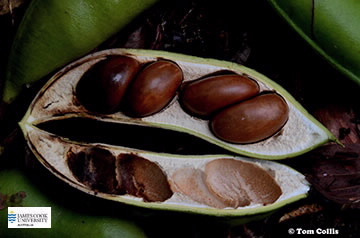 The pods are large and woody containing 2-3 large brown seeds which are highly toxic unless treated prior to roasting. The wood is dark and highly prized for cabinet work. JCU acknowledges the Yirrganydji and Djabugay Peoples for sharing their Indigenous Knowledge and pay respect to the elders past and present. “Known as Yiw-oo-rra. The bean fruit inside the pods were specially prepared to extract the toxins through a long process which involved baking, slicing into thin strips before being eaten. Must be very careful in preparing the fruit. The Kuyka (flowers) are a seasonal ‘calendar’ indicators for certain animals”.